Independent agent representing top spinning companies from India, Indonesia, China, Taiwan, Pakistan, Turkey, etc. 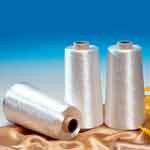 We offer the widest range of yarns in cotton, viscose, polyester, acrylics; spun and filaments; natural and dyed and all kinds of specialty yarns such as organic cotton, mercerized, etc. The company is spearheaded by ex-CEO of a very large spinning company in USA/Canada with in-depth knowledge of the industry and a wide network across Asia and Americas, thus assuring our clients the best solutions for their yarn and fabric outsourcing.